Further details including race times are also available by clicking on the link above. Ages as at 1st September 2014 (Masters as on the day). All athletes must represent first claim club, wear club/school vest and have North Wales qualification. Team and individual awards. P.S. 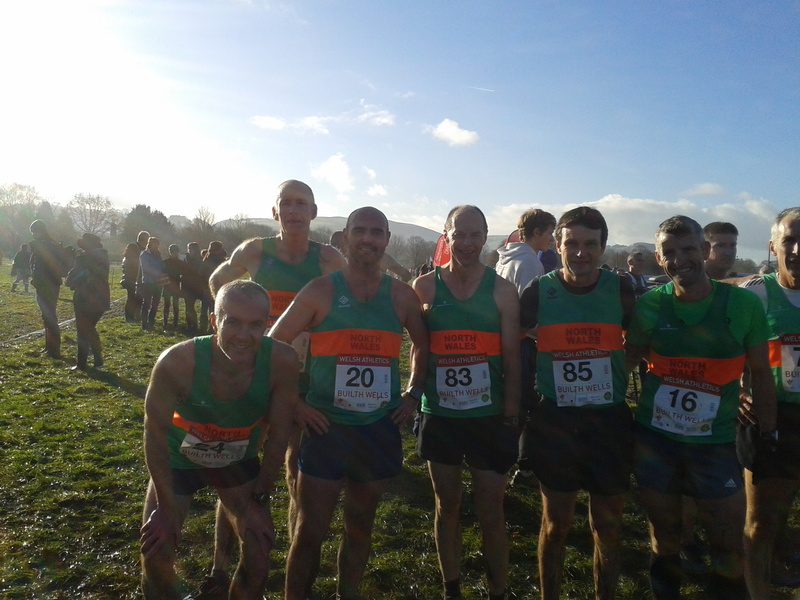 Reminder – Lilleshall XC on 31st January 2015 too, a bus will be going, more details to follow. There were 93 finishers in the pre-Christmas 21st December Penrhyn Castle ParkRun where Arwel Lewis was the 1st Eryri finisher in 4th place overall & 1st MV/55 in a PB time for the course of 19:44. Other notable Eryri finishers were: 2nd Female, Bronwen Jenkinson in a PB time for the course of 21:08. 14th & 1st MV/45 Paul Jenkinson 21:53. 21st & 1st MV/50 Ashley Wager 22:34 and 37th, 1st MV/70 Don Williams 25:17 which was also a PB time on the course for Don. In the after Christmas Penrhyn Castle ParkRun, there were 103 finishers in what were the worst & muddiest conditions yet for the event! Arwel Lewis was again the 1st Eryri finisher & 1st MV/55 in a time of 22:01 with: 14th & 1st MV/60 Eurwyn Edwards 22:17. 37th & 1st MV/70 Don Williams 25:55 & 54th, 1st FV/60 Maggie Oliver 27:51. The previous day, Arwel Lewis was amongst the 410 finishers in the annual Chester Round the Walls 4.6mile Boxing Day race which included a loop of the very muddy Chester Racecourse!! but a very scenic and enjoyable run along the City’s walls. Arwel finished 34th overall (2nd MV/55) in a time of 28:04 with Roy Jardine 337th in 41:55. Once again the Eryri Harriers club committee will be organising the 5.5 mile Xmas Fun Run around Llyn Padarn, starting from the Royal Victoria Hotel. Non-club members welcome. £5 entry on the day, includes soup and mince pie. Fancy dress positively encouraged, with a prize for the best one and the usual guess the Secret Santa. Registration from 9.30am, recommended that you arrive early. Run starts at 11 sharp. It was cold, muddy and hard work but typical cross country fun on quite a hilly course! In a race with nearly 100 runners, Dylan Jones was an impressive (13th) overall and 3rd in the MV40-44 category, with Steve Jones (27th) and Arwel Lewis (43rd, 4th in category and nursing a cough!) helping to bring the North up 1st MV50 team. Steve also achieved a fantastic podium position coming 1st in the MV60-64 category! James McQueen had a strong run too, coming in at 66th overall. Well done all! 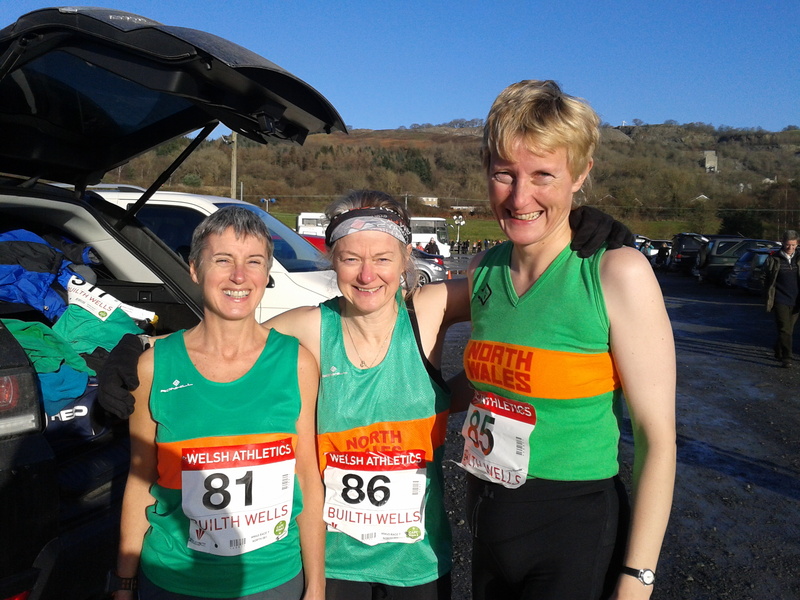 Great running by Helen Blair (24th), Sandra Rowlands (34th) and Ellie Salisbury (43rd and 3rd WV50-54) gained them a brilliant 1st team prize for Eryri Harriers aswell as contributing to the 3rd position for North Wales in the inter-regionals! Becki Law was 10th overall in the senior ladies race. Brilliant to see some of the younger athletes too, with Michael Spill running in the U13 boys race, coming in 40th position, and helping to bring the North up to 3rd position. Annabelle McQueen also ran well bringing the U15 girls up to 3rd position, coming in 24th in her race. John Spill and Steffan Williams ran well for the North in the U17 mens race, with North Wales coming in at 2nd place. Owen Roberts was 11th overall in the U20 mens race, also bringing the North Wales team up to 2nd. Bronwen Jenkinson (despite her feet never warming up! ), came in a strong 7th position in the U20 category. Well done everyone representing the North and Eryri Harriers too! 21st December – Christmas Fun Run from The Victoria Hotel Llanberis at 11:00. 31st Mar – Moel Tryfan, 1st Tuesday evening race of 2015! On his Border League debut, 16 year old John Spill finished in an excellent 4th place in a time of 33:51 on the undulating 6mile course just 3 seconds behind 3rd placed Darren Rowlands (Wrexham) in a race won by Darren’s club colleague Daniel Weston 33::00 ahead of Prestatyn’s Dean Longley 33:09. Next home for Eryri was Martin Cliffe in 24th place in a time of 36:15 followed by: 79th Stuart McDonald 40:02. 81st Arwel Lewis 40:06. 98th Rhys James 40:53. 156th Ashley Wager 43:52. 215th Jo Moore 47:06. 257th (2nd MV/70) Don Williams 50:33. 291st Alison Donnelly 53:45 and 311th Roy Jardine 59:11. There were 314 finishers as both Eryri men’s and women’s teams placed 7th in their respective 2nd Divisions on the day. Renewal of FRA Membership should now be done on-line. Existing standing orders are no longer valid and will not work. Anyone who renews before 10th December will receive their Handbook and Fixtures Calendar before Christmas, and if you choose to set up a direct debit payment before the end of the year you will get a £2 discount from the full membership rate. To renew your FRA Membership please go to the link www.sientries.co.uk/fra/ and follow the instructions. This link can also be found on the FRA web-site at fellrunner.org.uk. It is also possible to renew by cheque if you don’t have access to the internet – please call Martin Stone or Debbie Thompson on 01931 714106. For any queries please call Martin or Debbie, or get in touch with FRA Treasurer Andy Watts (details in the 2014 Handbook). 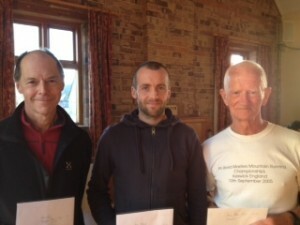 Richard Roberts stormed to first place overall over the challenging 9 mile Cardington Cracker Race in its 28th year of being run. Steve Jones came in at 18th and easily won the M60 category. Mike Blake arrived direct from the airport after a week in Tenerife to come third in the M65 category and shaming everyone with his tan. Always a great pre-Christmas feeling to the event. Next year is the first Sunday in December 2015. Just a quick message to see who’s keen on a slightly different trip for next year. The race is in the Isle of Man – an English champs, which means the club won’t fund anything. 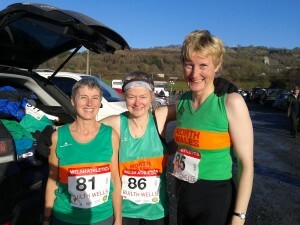 It’s a 15 mile coastal fell race, details: Bradda. Date is July 11th, flights with Easy Jet at around £50 from Liverpool and also same weekend as a big music festival. Options of either camping or a cheap holiday home. It may sound like a while away but the entry limit is 300 so think it will fill very fast. Anyway let us know if keen and we’ll try and get something arranged.